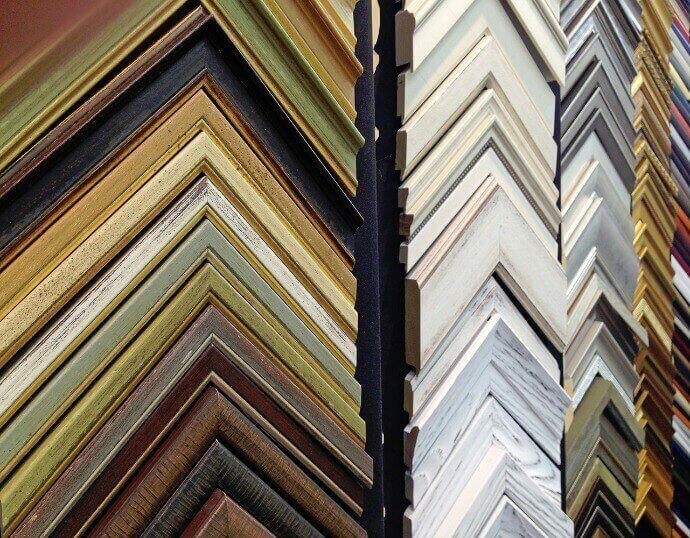 Framagraphic has an extensive selection of picture frame mouldings, with hundreds of colours, shapes, and styles to choose from. We did a rough calculation and we think our sample wall has somewhere between 1,300 and 1,500 samples of different picture frame mouldings. This enormous variety helps ensure the most appropriate frame moulding is matched to your project. During the design consultation, our experienced staff will be able to help you narrow down the choices best suited to your framing project and your budget. We carry frames from Roma, Larson-Juhl, Fotiou and a few others, too. 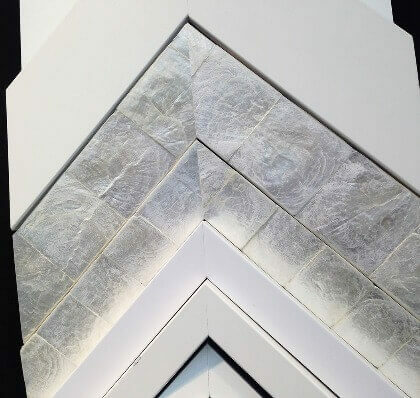 We have frames for traditional picture framing projects that involve glass and matting –the kind of frames you would use with a photograph, watercolour painting or to frame a diploma. Part of our selection of canvas floater frames. 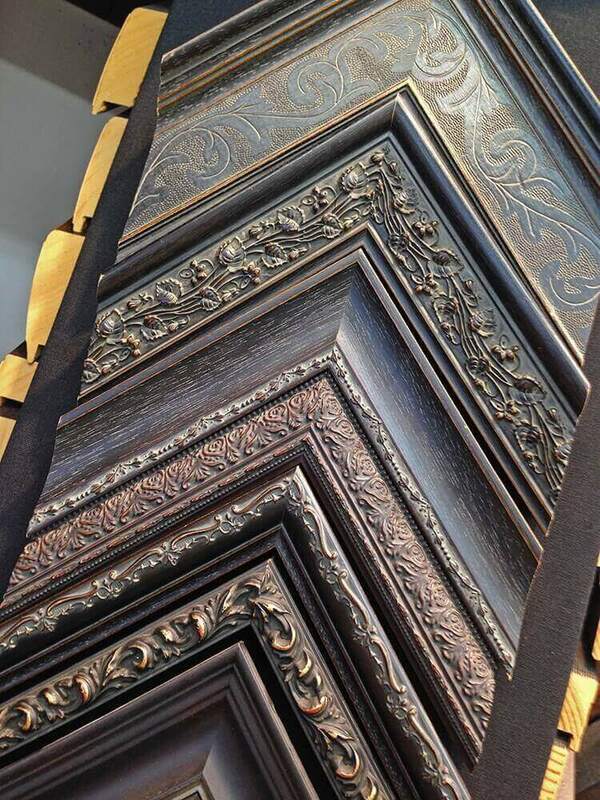 Traditional brown and black ornate frames. 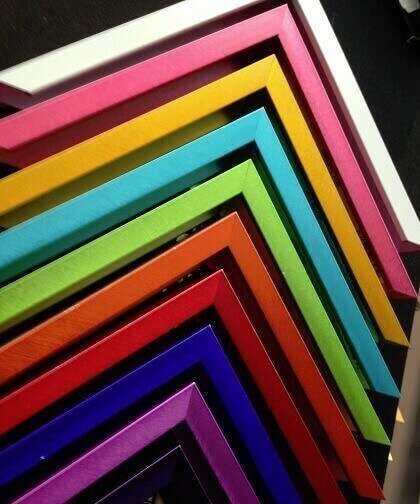 We also have a selection of canvas floater frames that we use on stretched canvas prints and paintings. These frames are meant to leave a gap between the art and the frame to give the impression that the piece is floating in the frame. 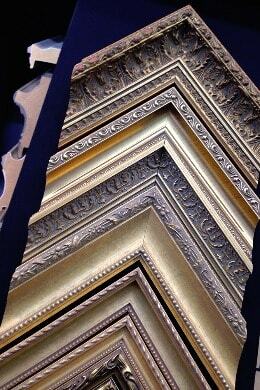 We have fancy, ornate frames in gold, silver and shades of brown and black for that traditional look. Juicy electric colours from our Neilsen metal frame collection. And we have simple modern frames with clean lines in most colours and sizes. 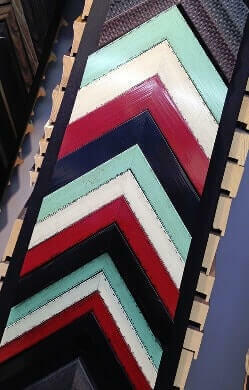 We even have frames in juicy colours like Galactic Blue, Tornado Red and Raspberry Fizz. If you’re into that clean white look, we have lots of frames to suit your tastes. 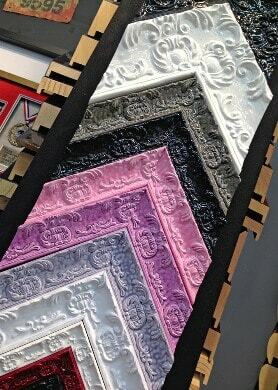 Even a frame finished with white capiz seashells. 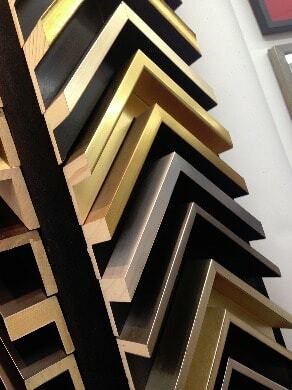 For wood tones, we have frames in clean blonde maple or dark ebonized walnut. 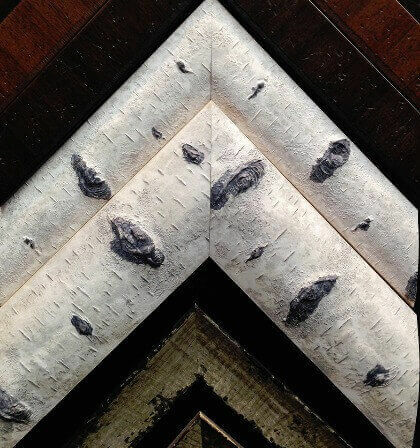 How about a frame that looks like it was made out of a freshly cut birch tree? We have frames with an olive wood veneer for that rustic Tuscany look. Other frames have a simulated leather finish, if that works with your piece. There are lots of other rustic frames with a beachy, barn board sort of look and others with a more distressed look that makes them seem like they came out of a monastery or an old English pub. If you want that glossy look we have frames with a high gloss lacquer and others with what they call a “piano finish” which is sort of a semi-glossy finish. We even have a frame with a chalkboard finish that you can write on with chalk. If you need a mirror and are trying to match something in your newly renovated bathroom you can bring in a piece of your cabinetry or a sample of your fixtures and we can try to match that.